You’re not going to believe this, but our forecast here in Michigan is predicting that we will be experiencing the coldest windchills in Michigan in over 25 years 😯 . That means -35 to -40 windchill factor. School has already been closed, and even our oldest’s college has closed shop for 2 days. In fact, I just picked her up because this week will pretty much be a Christmas break all over again (especially since I re-did our tree 😆 –click here to see it). With all of THAT being said, a big bowl of hot savory soup is what folks really need to warm up. 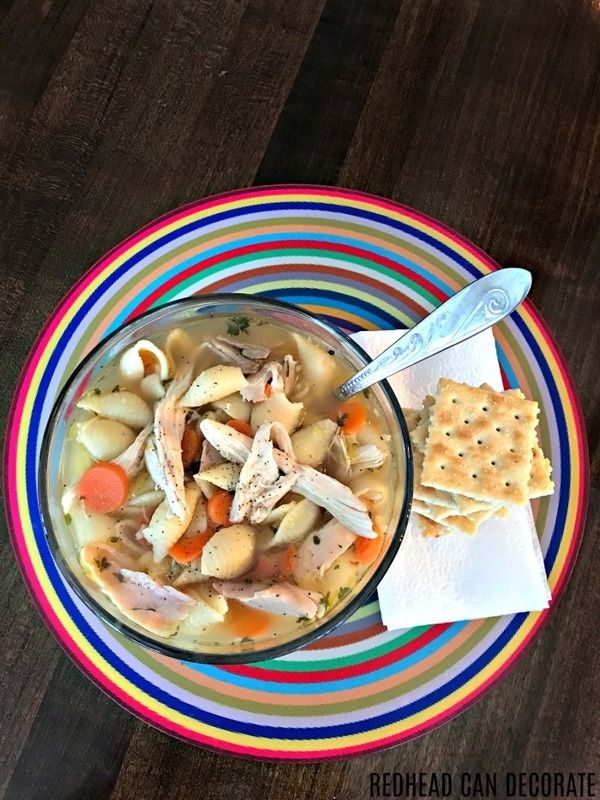 My very quick & simple “Rotisserie Chicken Noodle Soup” is my daughter’s favorite soup, and I make it for her almost every Sunday to take back to school with her. My husband also loves it and always steals as much as he can before she leaves. You may be wondering why I use a rotisserie chicken in lieu of a fresh or leftover chicken. Well, I have many reasons, really. 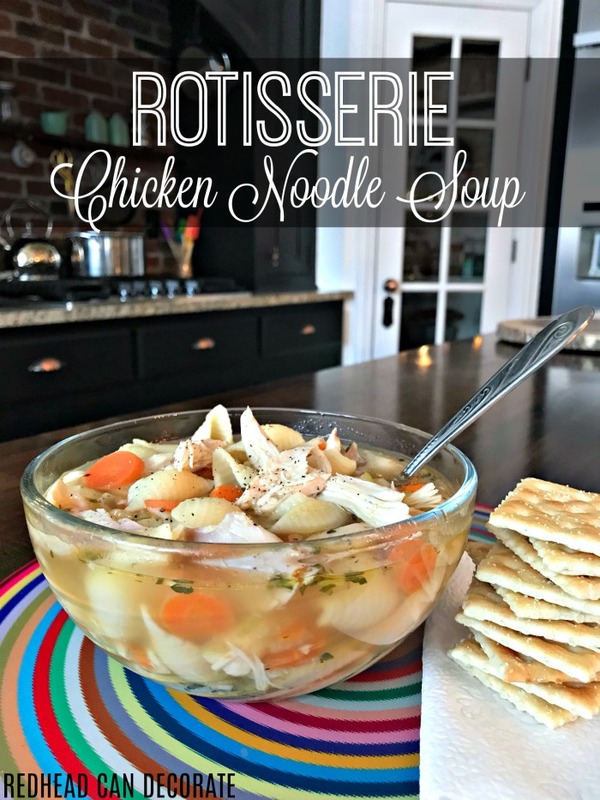 I find a full rotisserie chicken gives the broth the best depth in flavor. I use the rotisserie chickens from Costco because they are my favorite tasting. They don’t have that “smokey” fake flavor you’ll find in some grocery store rotisserie chickens. Kroger is another one I like. It’s FASTER. I’ve actually made this soup in 1 hour flat, and it tastes like I have been preparing it all day. The meat is extremely tasty and tender, and there’s a lot of it. As proof, when I made the soup in the photos I gave a little sample to my daughter when I was taking it off the bone and we both agreed that it tasted like lobster. Less risk of salmonella bacteria because the chicken comes to my house already cooked. I have 1 chicken delivered every Friday, I am not joking! Here’s how rotisserie chickens are delivered to my front door in case you are interested. Have I convinced you yet? I sure hope so. 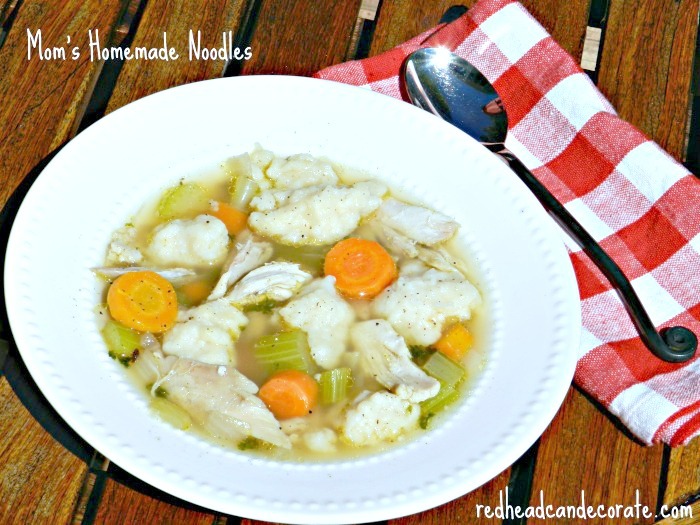 As a bonus, I’m leaving my Mom’s homemade Polish noodle recipe at the bottom of this post. Stay warm, and stay tuned for a really pretty Valentine’s Day table for two! I am photographing it tomorrow 😀 . *optional ideas: add a splash of lemon & minced garlic for even more flavor. Adding a little tomato sauce also enhances the chicken flavor. Set the entire rotisserie chicken (cold or hot) in a large pot. Pour chicken stock over chicken and simmer on medium heat for 30-60 minutes turning chicken over in the middle. Chicken should be very close to falling apart if not already doing so. Remove the chicken from the pot with large forks, or carefully with tongs, and set on a large plate to cool. Add remaining ingredients tasting your broth until you feel it's just right. If it's too salty, add water. If it's not salty enough, add a little salt. Let broth simmer with veggies & spices for another 30 minutes until veggies are tender. While waiting for broth to finish up, pull all of the chicken off the cooled chicken into bite size chunks, and then add all of the chicken to the broth. Don't forget to use the dark meat on the bottom of the chicken- it's the best part. Add cooked pasta at very end, or keep on the side to add when you serve it (see homemade Polish noodle recipe below). Hey, Lori! All the Lake Orion chickens will be gone soon if I keep posting this on FB lol!!! Getting married for 2 nd time on June 29th. I was 21 and now 64 but this is the man I should have been with all along. 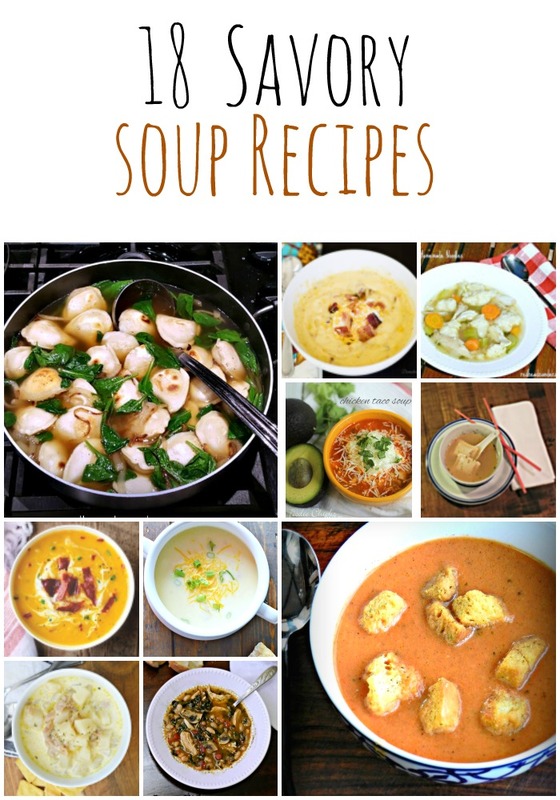 I read the soups and saved a few. Read with mounting excitement the food delivery. I know exactly what I want and will use this way to buy my surprise picnic wedding. Thank you. Hopefully it will be warm and flowers blooming. Nothing beats a hot bowl of soup to warm the soul.